I recently implemented a quarterly theme that I want to share with you today. I hope you’ll get a good grasp of the tactical things we did but I hope you’ll also take away the secondary meaning, the importance of taking care of your employees. It’s crucial you include them in the success of the company and make everyone feel wanted. This theme relates to the book Scaling Up by Verne Harnish where you concentrate on four different things; people, tasks, strategy, and execution. You do this by having a communications rhythm, focusing on key metrics, having and achieving quarterly rocks then having a strategy and a plan. We wanted to finish the year strong, so we implemented on of the things Verne talks about in the Scaling Up book and that is the concept of a theme. A theme is used to get everyone on board with the goals and objectives of the company. Typically, these themes are carried out quarterly and are centered around the critical metric trying to be achieved. First, we decided on the metric, which was revenue. Then we figured out how everyone could help with revenue. After that, we put together a series of communication messages, a few gifts for the team and a weekly cadence for communicating about the theme. We created a custom field in ConnectWise and created a dashboard to track leads. We looked at leads generated by department, in order to create a little bit of rivalry between departments, and we started monitoring it at the beginning of the quarter. This is the metric we used to measure success. In addition, we established a communications pattern. At the end of the week, I created a short 2-3-minute video in front of a green screen with a finish line. The idea behind these videos was to motivate the teams and keep the theme alive in order to motivate to the finish. I talked about the wins in the previous week and told the teams where we were. If we fell behind, we would talk about that as well. In each video, I singled out a person and filmed them in random locations. I use a tool called BombBomb to send emails out. Through this, I can track opens and clicks to see who is actually looking at it. The teams also have the opportunity to respond back and make comments each week. 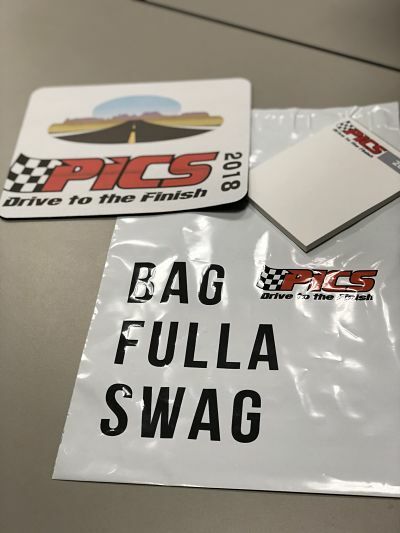 I also ordered plastic swag bags and put a logo on it that I had designed at LogoNerds. In our last swag bag, I tried to incorporate something from one of our customers. On Mondays we have our long meetings, so on Mondays, we try to drive the theme home. We talk about wins, where we can improve and where we stand in revenue. If you are looking to implement something similar, all you need is a mobile phone, maybe a tripod so you have a little more room when filming the videos, and a tool like BombBomb to track communication.